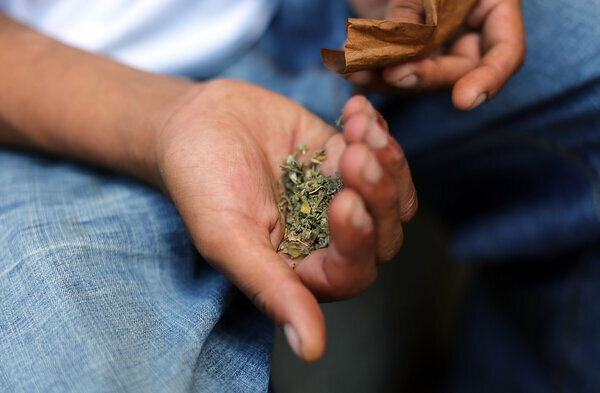 A street drug made of various chemicals sprayed on tea leaves, grass clippings and other plant material continues to send thousands of people suffering from psychotic episodes and seizures to emergency rooms around the country. In 2015, calls to poison control regarding the drug already have almost doubled, compared to last year&apos;s total, and health professionals and lawmakers are struggling to keep up with the problem. Some call the drug K2, or spice. It&apos;s also widely known as "synthetic marijuana," because the key chemicals in the spray are often man-made versions of cannabinoids, a family of psychoactive substances found in marijuana. But the ingredients and concentrations used in this street drug vary widely, and it can be very different from marijuana in its effects. 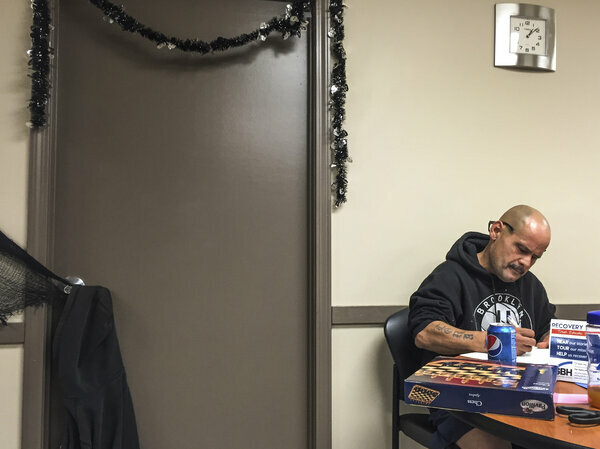 At a drug rehabilitation center a short drive north of Syracuse University, where 52-year-old Edwin Santana has come for treatment, they call the drug "spike." Santana, who was born in the Bronx, is a few weeks into his detox program at Syracuse Behavioral Healthcare. A longtime heroin user, he became homeless after multiple run-ins with the law. Then, he says, a couple years ago he developed a problem with spike. "It was getting out of hand," Santana says. "I was starting to smoke every day. And you know, spike is a drug I respect, because you don&apos;t know what you&apos;re getting." The drug also inspires fear in him. "Not a little bit of fear. A lot of fear," he adds. It&apos;s hard to guess what will happen after you smoke or ingest spike, both users and drug enforcement officials say, because the chemists who make it are constantly changing the main ingredients — tweaking a cannabinoid&apos;s chemical structure, or mixing it with other substances entirely, which can change its effects. "You get stuck when you&apos;re on spike," Santana says. "And it makes you do all kinds of crazy things, man. I&apos;ve seen people roll around on the floor and stuff like that." Smoking the drug landed him in the hospital. Angel Stanley, a psychiatric nurse at the rehab center, ticks off the symptoms she&apos;s seen in patients who have smoked spike: "Auditory hallucinations, visual hallucinations, disorganized thinking, delusional thinking. Paranoia is a big one." Many of these patients, she says, expected that smoking spike would be just like smoking regular pot, because the drug was sold as "synthetic marijuana." The drug first became popular with teens, who were looking for a new way to get high for just a few dollars. But now, Stanley says, she&apos;s seeing older users, too. "They&apos;ve gone from using some marijuana in the past, a little bit of alcohol use over the years, and now all of a sudden, they&apos;re in their 50s and they&apos;re addicted to spike," she says. Often users are also homeless. "A lot of people who use it, their reality is pretty bleak, so they use spike to escape that reality," explains Matthew, who asked that we not use his last name. He just finished an inpatient program at Syracuse Behavioral Healthcare to help him stop using spike and cocaine, and doesn&apos;t want future employers to find out about his past. "The main thing with spike," Matthew explains, "is this: It is the cheapest, most effective high in Syracuse right now. Is it the most enjoyable high? Probably not. But it&apos;s the cheapest, hands down." The question facing workers at rehab centers and emergency rooms is how to effectively treat users of a drug that&apos;s essentially an unknown mixture. "We know how to treat an alcoholic," says Jeremy Klemanski, who heads Syracuse Behavioral Healthcare. "We know how to treat an opiate patient. We know how to treat somebody&apos;s who&apos;s using cocaine. But, when we say we know how to treat somebody who is using synthetics — to a certain extent we do." Health professionals faced with such a patient are usually flying blind, Klemanski says. Some types of spike can be detected in drug tests, but not all. "Until we get to a point where the treatment system has as sophisticated testing as the labs that are inventing and creating these things, we&apos;ll struggle," he says. Lawmakers are paying attention. The federal government has permanently banned more than a dozen types of synthetic cannabinoids. But packets of "spike" and "K2" and "spice" are still sold in many mom-and-pop convenience stores, because they contain versions of cannabinoids not covered by the ban, says Matt Strait of the Drug Enforcement Administration. "They are in a legal grey area," Strait explains, "because they&apos;re not specifically named in the statute." That keeps makers and dealers of spike one step ahead of state and federal laws. Congress is weighing how to streamline the process of regulating new versions. Meanwhile, the Drug Enforcement Administration has been investigating and temporarily banning some new forms of the drug. But back in Syracuse, some health professionals and spike users say the government can&apos;t move fast enough to keep up with new varieties hitting the streets.